Help put together a 110-piece 3D printed George Washington puzzle #3DxMuseum #3DThursday #3DPrinting #3DScanning « Adafruit Industries – Makers, hackers, artists, designers and engineers! Last weekend, I joined a team of veteran 3D designers and 3D makers to put together a project for the second annual Art Bytes Hackathon hosted by the Walters Art Museum in Baltimore, Maryland. We are putting together a complete 3D printed statue to replicate a massive 3D printed bust of George Washington, currently at the Walters during the restoration of the monument where it is typically housed. Last week, as part of the museum’s 3D scanning and modeling project undertaken by Direct Dimensions, a scan was made of a bust of George Washington. The bust is a copy of a statue in the style of Giuseppe Ceracchi’s neoclassical “Bust of George Washington” (1791-1792) which is currently on display at the Walters Art Museum as part of the restoration of the nearby Washington Monument. “George Crowdsourcington” used the 3D data from this scan and sliced it into 110 digital pieces – each tagged with specific coordinates (a handy feature for faster puzzling). 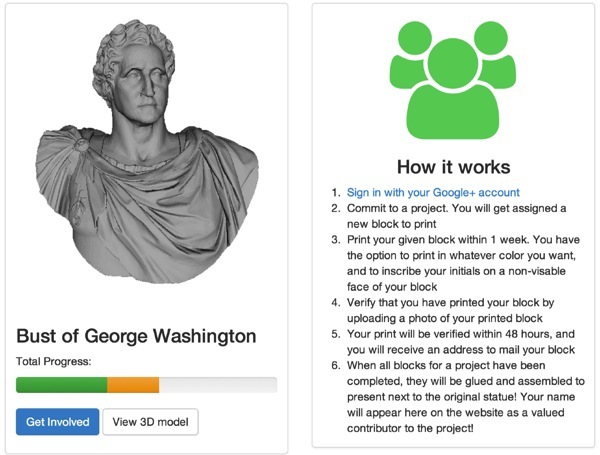 Through the site We the Builders, people may request to print out a piece of the puzzle with their home 3D printer – “George Crowdsourcington” hopes that these 3D-printed puzzle pieces will be returned to them by the end of this week so they are able to assemble a 3D replica of the Washington bust in exactly the same scale. We the People of the Maker-verse, in Order to form a more perfect replica of a copy of a statue in the style of Giuseppe Ceracchi’s odd neoclassical “Bust of George Washington” (1791-1792), establish a Practice of Full 1:1 Scale Community Appropriation of Public Artworks, insure Art Curation/Museum critical controversy and policy discord, provide a new means of enjoying humanity’s shared cultural capital, promote the general practice of Making and Personal Manufacture, and secure the Blessings of the Interwebbies to this Baltimore icon and other oft-neglected sculptural works of art in Perpetuity throughout the Universe known and unknown, do ordain and establish this Art Project for the People of the Internet and Land Territories. To be part of this 3D printed George Washington puzzling project visit the We the Builders site. Read more. If you have access to a 3D printer, please join us to help us complete the project!